Hydro Majestic Tour & High Tea - sold out! Yulefest at The Carrington Hotel - sold out! Camden Country Tour - sold out! 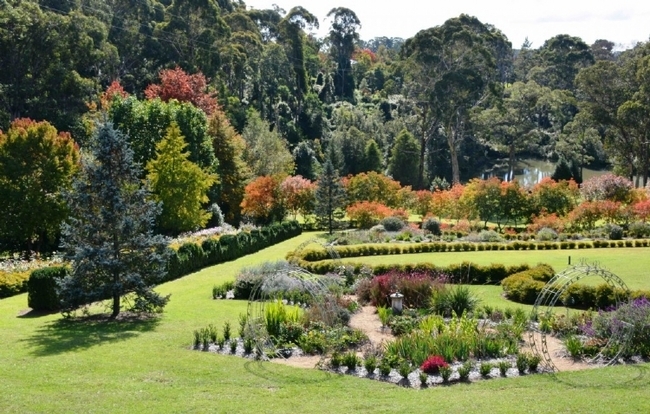 Wildwood is owned by plant enthusiasts Wayne and Sue Tapping, who have been developing the garden since 1980 when they bought 10 hectares (25 acres) of land at Bilpin in Sydney's Blue Mountains. Most of the sloping site was densely covered with mature trees and black wattle scrub, but there were some open spaces. As well as a beautiful site, the area has deep volcanic soil and access to bore water making it a wonderful place to make a garden. Sue's plan was to create a formal garden without losing the wildness of the native landscape. Hence the name for the garden of Wildwood! The Tappings have a deep passion for plants and growing. 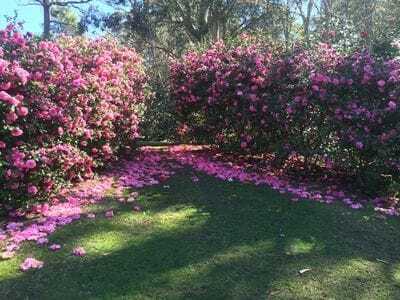 They ran a garden centre at near by North Richmond along with a growing nursery at Kurrajong for many years and also operated a nursery at South Windsor. Indeed, they only closed Wayne's Home and Garden in 2010 when the site was sold. Over the years many of the plants from their retail and growing nurseries have found their way into the garden. Sue is also a collector of cool climate perennials and shrubs, including hellebores, clivias, magnolias, camellias and hydrangeas. They have also amassed a collection of cool climate trees including maples and dogwoods. There is something exciting to be found in flower throughout the year. The first planting was the weeping cherry walk, inspired by a trip to Melbourne buying plants for their nursery. Sue recalls that Wayne was taken with a row of weeping cherries in one of the nurseries they visited in the Dandenongs. On his return to Bilpin, he set about planting nine pink weeping cherries (Prunus subhirtella 'Rosea'), which today are under planted with hellebores to present a breathtaking picture in early spring when the trees bloom. Disclaimer: Tickets must be purchased by credit card. Tour requires a minimum of 8 people to continue.